The suspect is now facing attempted murder and hate crime charges, while the policeman is being praised for saving the life of the 34-year-old homeless man. At around 8 p.m., Sgt. Todd Johnson was riding his bicycle home from work when saw a man at a bus stop lunging at another man with a knife. Johnson heard the attacker yelling racial slurs at the homeless man while trying to stab him. Johnson got off his bike near the Santa Barbara Public Library, confronted the suspect, identified himself as an officer and pulled his gun. The sergeant also instructed bystanders to call 911 for police backup. The attacker, 40-year-old Francisco Antonio Diego, then dropped his double edged knife. Officers arrived and arrested Diego, a resident of Miami. Investigators say Diego had just arrived in Santa Barbara, and he has an extensive criminal record in Florida. 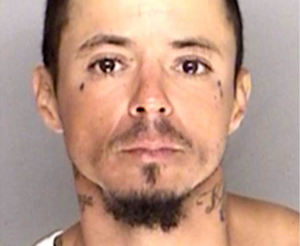 Officers booked Diego in Santa Barbara County Jail with his bail set at $100,000. Homeless or illegal, or not, why is it these upstanding citizens always seem to have the money to put those beautiful tattoos all over their bodies? And then the liberals like our Honorable Nancy Capps provides taxpayer money to remove them. They can afford to put them on, they can afford to take them off. Next week the Senate is going to vote on Kate’s Law solely. Forget calling your Liberal Senators, they will never vote for it even though it was because of Kate, only only daughter, who was shot and killed in San Francisco by an illegal who had 6 – SIX = felonies and was suppose to be deported by San Francisco did not turn him over to ICE, and Kate died in her Dad’s arms. We is still just sitting in jail, no formal charges, no court date! Nancy Capps? Is that some coy mashup of Lois and Pelosi? Welcome to California, you’ll fit right in. Actually, he could apply for amnesty, get a drivers license and insurance, got to college, attend law school, and eventually become a judge….it’s all there for the offing. This IS the land of opportunity! My contacts at the Santa Barbara Police Department have shared that this man is a resident of Mexico, and he was in California because he had a job offer from Greg France at Mar Vista Berry. He was only in santa Barbara until he could get to Nipomo. I urge SLO County residents to push back against this type of scheme, as the resulting economic benefits of embracing ‘Sanctuary City’ are far outweighed by the social cost of jails, schools, hospitals, social welfare, etc., etc., etc. Reject Sanctuary City, reject senseless crime. Well, you are preaching to those that 1) Care, and 2) can read – thus, you are not being read by the bulk of democrat voters (alive or dead) who make this state what it is. Sorry. Send him back to mexico in a wooden box! “Resident of Miami” leaves us clueless about where Francisco originally hails from? He wouldn’t be in the USA illegally, right? Nah! Double-edged knife doesn’t sound like he was slicing cheese on his cross-country trek. What brought this admirable 40 year old to the Pacific Coast? Santa Barbara like San Luis Obispo coddles the homeless so they attract them. Well its a good thing Fransico stopped the man from taking his cigs. Good God next the man might take his sandwich! Best to kill the man before it escalates to taking sandwiches.